Figures 21 & 22. 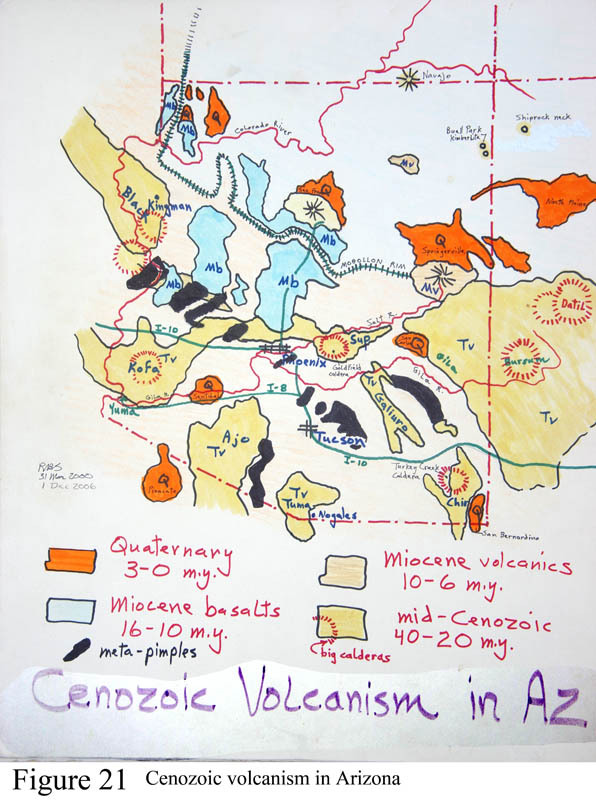 Cenozoic volcanism in Arizona. The past 30 m.y. has seen very vigorous volcanism in Arizona which is easily divided into three cycles of differing character. (1) papa rhyolite fields; (2) flood basalt fields; (3) mama volcanoes and surrounding basalt fields. During 40-30-20 m.y. ago southern Arizona received several major big papa rhyolite volcanic fields. Figure 22 attempts to show action around a larger eruption. Later during a time-transgressive stage, older in the south and younger in the north, there has been 'flood basalt' volcanism. Starting in Mexico extensive flood basalts covered over the papa rhyolite flows. In northern Mexico and southern Arizona the floods are ~18 m.y. old; north of Phoenix they are 16-10-7 m.y. old, and then a younger-still episode of flood basalts track northward onto the edge of the Colorado Plateau, about 10 m.y., 6 m.y. around Flagstaff, and 4 m.y. until recent times farther north on the Plateau and north of the Grand Canyon. A good showplace of a thick pile of basalt flows is along I-17 north of Phoenix where you drop down into the Verde Valley - the freeway descends a canyon with the roadcuts exposing dozens of basalt flows. A spectacular road across Verde Valley that ascends back up through this same thick lava series is the 'General Crook' Highway, highway 260 that begins at the town of Verde Valley and connects with highway 87 near Strawberry. A youthful sister complex is the Pinacate field south of Lukeville and NW of Rocky Point. Two imposing rhyolite centers are seen at Flagstaff and Show Low-Greer, with Flagstaff's mama 'composite' volcano called the San Francisco Peaks active at 100,000 years ago and Show Low's Mt. Baldy at about 7 m.y.. The youngest volcano in Arizona is Sunset Crater near Flagstaff, erupted at about 1065 AD, which buried a Native village that was then re-occupied soon after. The oldest and most explosive volcanoes of Cenozoic age are found in the 'mid-Cenozoic' age class of the figure. These fields include the Chiricahuas, Superstition, Tumacacori, Galiuro, Ajo, Kofa, and Black Mountain fields. A large field called Bursum-Datil is found in adjacent western New Mexico. 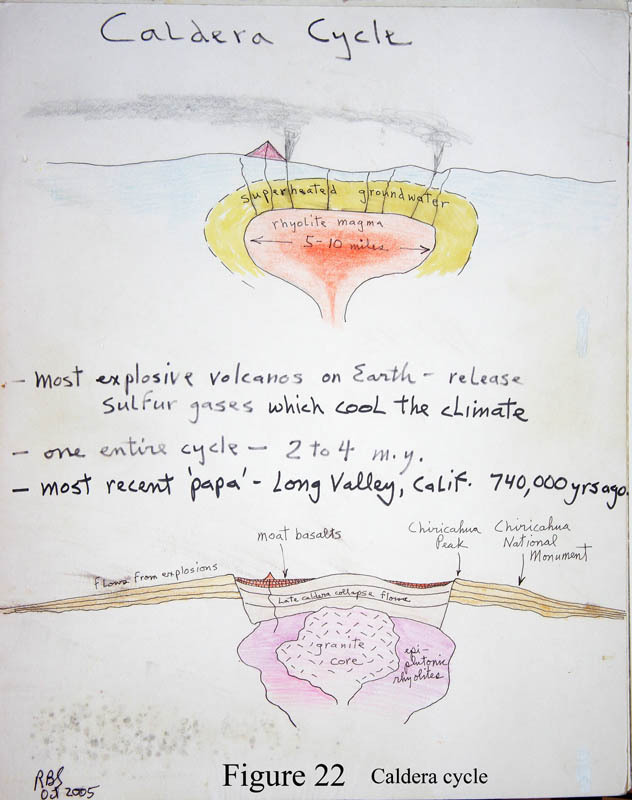 The red lined circles on the figure are big papa volcanoes with significant calderas. If one takes the Apache Trail dirt road from Apache Junction to Roosevelt Dam, following along the course of the Salt River going upstream, one travel through the blowout ejected from three papa volcanoes of the Superstitions sitting side-by side. A great field trip. In one spot you can see the layers pointed straight up--where you're inside the actual vent. The different-looking rock layers at the dam are tilted sediments of the far more ancient Apache Group. At Chiricahua National Monument, SE of Willcox, at the end of the loop drive, you are standing outside the vent on the top of a second major ash flow from the volcano. See Figure 22 and the map, Figure 30. Looking at high Chiricahua Peak on the skyline to the SE from this location, you are looking across the buried caldera at the far edge of the vent - buried under the last flows. The trail from the top back down to the visitor center walks down through the thickness of the outpouring where are seen some amazingly tall and narrow spires of weathered ash flow material. Nearby Pinery Canyon road takes one over the top of the volcano and down the eastern scarp face of all the strata, to arrive at the hamlet of Portal on the east side. Along the route you may sense that the ENTIRE MOUNTAIN RANGE has been tilted down to the west in a later disturbance. The Ajo field covers several adjacent mountain ranges. From along highway 85 from Ajo to Lukeville, inside Organ Pipe Cactus National Monument, there is a great view of various rhyolite flows in the Organ Pipe range east of the highway (Figure 61). The softer layers are ash falls where air-fall particles cooled before coating the land, while the bold cliffs were pyroclastic flows - very hot dusty ash clouds that moved outward from the center at 80-150 mph, stopping and then condensing while still hot into hard brittle rhyolite. New Mexico's really giant Bursum-Datil field is something to behold. Find the Aldo Leopold vista along Highway 180 south of Glenwood and north of Silver City and look to the east at the imposing western escarpment of massive thick cliff-forming rhyolite flows from Bursum. For hikers, find the road to Big Dry Canyon and walk inside truly massive rhyolite flows until you're stopped by cliffs. Watch for rattlesnakes and mountain lions. I wouldn't have wanted to be within 500 miles of this eruption. Then travel south on 180 to Silver City and back north on route 15 to Gila Cliff Dwelling National Monument, built in a natural cave by early inhabitants in the rhyolite ash flows ejected by Bursum, in the country of the headwaters of the Gila River, a fitting birthplace of Geronimo. Then, with nothing better to do, go visit City of Rocks State Park, off route 180 towards Deming, to view a rather strange erosional effect of a rhyolite ash flow that came from some lesser papa eruption to the east - a big collection of giant rounded boulder masses. Big Basalt Fields: There are four youthful basalt fields (younger than 6 m.y.) dotted with cinder cones that are worthy of note here: the Pinacate field of Sonora north of Rocky Point, The Flagstaff field, the Springerville field, and the North Plains field of El Malpais National Monument south of Grants NM. All have obvious basalt cinder cones and lots of flat black lava flows. All are quite obvious when in the area. Lesser imposing fields are the Sentinel field west of Gila Bend along I-8, and the San Carlos field, north of highway 70 at San Carlos - east of Globe. All have some unique features. The Pinacate field has about 10 big explosion craters called diatreme or maar craters caused by magma contacting shallow groundwater. (Maar craters are deeper than the surrounding land.) Explosions like this are a bit unusual for basalt, with Pinacate craters up to a mile-plus in diameter. Basalt flows at San Carlos contain nodules of Earth mantle rock that are rich in transparent green olivine crystals (Figure 43), used in the worldwide gemstone trade - called peridot. Similar nodules are found in the basalt flows of the San Bernardino field at the junction of Arizona, New Mexico and Sonora. Some basalt flows seem extra-charged with fluids or gases and can flow for 30 miles or more. Highway 191 crosses one such far-traveled flow north of St. Johns headed for Sanders, that originated far to the east in New Mexico. Core Complexes. Contemporaneous with the major Cenozoic-age volcanic fields was another more mysterious process, the production of a series of some 30 centers of extra-hot granite intrusions that contain two abnormal minerals - white mica (muscovite) and red garnet (almandite) - that tell us that they formed under conditions of extreme heat & pressure. The granite magma masses rose quickly and seem to have produced an up-arching of surrounding land, in a manner like a teenager's pimples. The process of intrusion produced a contact zone with older rocks called a mylonite, a distinctive layered zone of intense pressurized fault movement along the edge of the granite mass that produced a layered nature to the melted granites, which are called 'gneiss.' Arizona's core complexes are shown in black in Figure 21- note the great linear trend - unexplained. Evidence forces us to conclude that the height of the pimple became considerable, quite enough to cause massive 'landslides' of entire thicknesses of older cover rocks off the flanks of the pimple. The technical term for these special granite mountains is 'metamorphic core complexes.' Further details are too tiresome for here. These complexes are found strung out along a well-defined trend line that begins in Sonora, tracks across Arizona, eastern Nevada, and finally into British Columbia. In Arizona the core complex mountains are aligned in a very straight line trending NW and SE, and includes the Pinalenos (Grahams), Catalina-Rincons, Picacho Mountains, South Mountain (just south of Phoenix), Harcuvars, and Rawhide-Buckskins in western Arizona and adjacent California. As well, in western Arizona, the production of the core complexes also produced a strange 'waveform' pattern to mountains and valleys that runs counter to normal N-S mountain directions, so that the main mountain ridges actually trend NE-SW. The off-angle pattern appears in Figure 31. This odd direction is seen in the NE-SW orientation of Tanque Verde ridge in the Rincons within Saguaro National Park (east) - where a great hiking trail leads the energized among us up to Mica Mountain highpoint of the Rincons with ponderosa groves below the peak top. Anytime while in the West, if you're wandering in granite terrain and start to find white mica and tiny red garnets in the streams, you're in core complex terrain. Even the Snake Range in eastern Nevada, site of Great Basin National Park, is a core complex, though the granite is poorly exposed south of the park.